The diagram on the left describes the order of the Cards as they progress through the positions in the framework while the deck is being quadrated. These positions from here on will be termed houses, and the card that resides in each house in the sun spread will be said to own that house. To start, notice the inner circle which contains the fixed and binary state cards. The fixed cards are shown as being linked to each other in the form of a triangle. This symbolism is reflective of the maxim that the fixed cards create an anchor through which the movement of the outer Wheel maintains its harmonic balance. The binary state pairs are represented by showing their connection using 2-way arrows. This symbolism represents the reality that even in the fixed nature of the universal 'Law of One', duality is present and creates an alternating sequence of attraction. The outer wheel then contains the remaining 45 cards that are always in motion whenever the deck is quadrated. Even though these cards are always moving, there is a sequence that these cards follow in relation to each other. Look at the Sun spread and notice the position of the in the spread. According to Richmond, the card that resides in that house is called the solar time card. We will use that card house (at the top point of the large triangle) to describe the movement of these 45 cards throughout the quadrations. If you continue quadrating the deck, on your 44th birthday the will again be in its original house (the solar time card house). This wheel maintains its movement unceasingly throughout life. Therefore, on the 45th birthday the cards will all be in the exact same houses as they were at birth, except for one important difference. The outer wheel of 45 cards will all return to their respective houses, but the binary state pairs of cards in the inner circle will be in their alternate houses. The and the will have changed positions as will the and . As a result of this, it will be seen that the first set of 45 quadrations (years 0 - 44) will be exactly the same as the second set of 45 quadrations (years 45 - 89) except that the binary state pairs of ruling cards will have changed places. From this we can see that there are a total of 90 unique quadrations, and on the 90th birthday the cards will be in the exact locations that they were in the year 0 quadration. Therefore, for years 90 and beyond, you start counting from 0 again. The description above shows the movement of the cards as they progress through a particular card house as the deck is being quadrated. However, another important progression is occurring at the same time as this counter-clockwise motion. When the wheel is moving in the clockwise motion, the card that moves into the solar time card house on the outer wheel represents the card house that the will be in for that year. For example, at the year 0 quadration the wheel moves clockwise and shows that the will move into the solar time card house. This means that the (solar time card) will be in the house at the year 0 quadration. At the year 1 quadration (rotating clock-wise again) the will then be in the house, and so on. Rotation of the Karmic Wheel in the clockwise direction exposes the quadration that represents the outward movement of the wheel. This represents the positive linear sequence of number, where the quadrations fan out in ascending order, starting with 0 and going to 88. At year 89 you will arrive again at the top of the wheel and will have rotated one complete cycle. Shows the movement of our birth card through the various houses in the framework. Shows the card house in the framework through which we act in the moment. 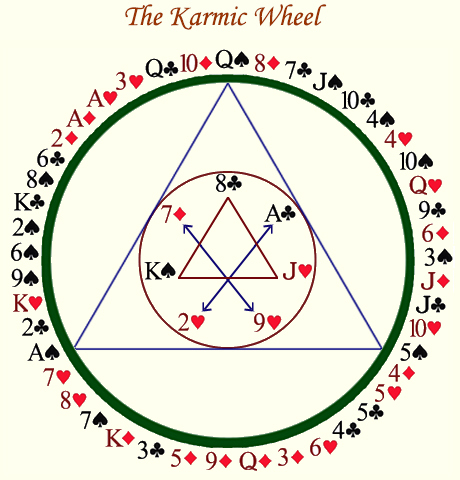 It indicates the characters and events present in the moment as they are colored by characteristics (karmic expression) of the card house in question. Signifies the effort necessary to align our lower will to the original will behind our birth contract. It is representative of the masculine polarity of the universe, outpicturing as the event horizon or the Rising event. Shows that the house the birth card resides in that spread represents the rising card. As a point of symmetry, the card in the rising spread that sits in the birth card house will be the moon card for that year. Rotation of the Karmic Wheel in the counter-clockwise direction exposes the quadration that represents the inward movement of the wheel. This represents the negative linear sequence of number, where the quadrations fan out in descending order, starting with 88 and going to 0. At year 89 you will arrive again at the top of the wheel and will have rotated one complete cycle. Shows movement of card energy through our birth card house (for the this is the solar time card house. Indicates the card that shows up in our birth card house through which we draw energy, and through reflection reveals the cause of the moment. It indicates the karmic patterns that underlay our inner expression. Signifies the type of effort necessary to align our lower desire with the original desire to incarnate. We have direct contact with this card energy through reflection in the moment, which as such is representative of the feminine (Moon) polarity of the universe. Shows that the house the birth card resides in that spread represents the moon card. As a point of symmetry, the card in the moon spread that sits in the birth card house will be the rising card for that year. Since the year 89 quadration represents the sun spread, it means that at year 89, the sun spread, moon spread and rising spread are all the same. Therefore, year 89 represents the point of greatest potential for the individual, having all 3 aspects of Self aligned to the same orientation. The graphic below shows a cross-section of the top of the karmic wheel using the sun spread as an example to describe how the quadrations fan out like a wheel. The object of this graphic is to show how movement of the karmic wheel produces the sequence of Rising and Moon spreads as it is rotated in both clockwise and counter-clockwise direction.